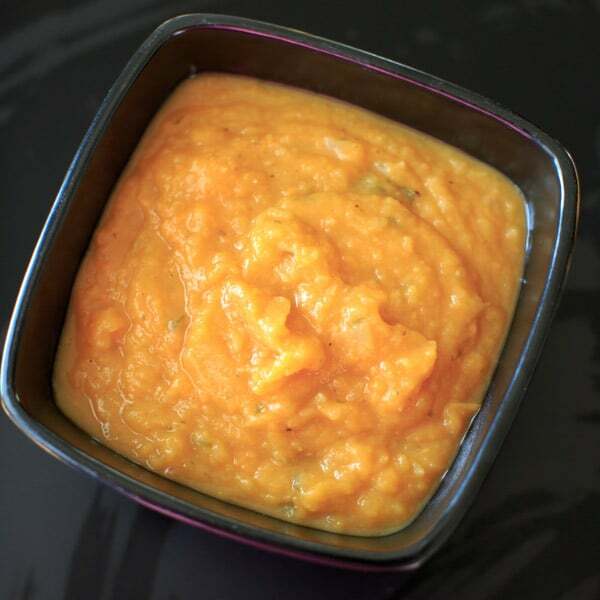 Vegan and Gluten-Free Sweet Potato and Apple Soup. Only 4 main ingredients plus spices makes this a super simple and delicious thick soup for the colder months. I had a little deja vu when I was making this soup. 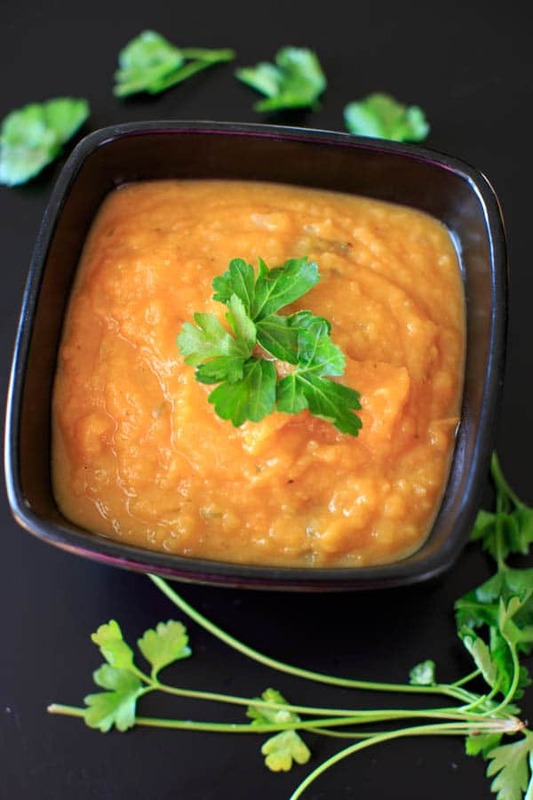 It wasn’t until I started writing this that I realized it’s because the only other soup I’ve posted on this blog is pretty similar: butternut squash and apple soup. I’m not sure why I’m so inclined to put apples in everything (see here, here, and especially here, and the list could go on) because I don’t like to eat apples plain! I especially have an aversion to people eating raw apples in front of me. I think it has to do with an old boss who always spewed apple pieces near me at my desk while biting into his afternoon snack. But I digress. Anyway, apple seems to work for me in all other forms. Especially roasted, in this soup. 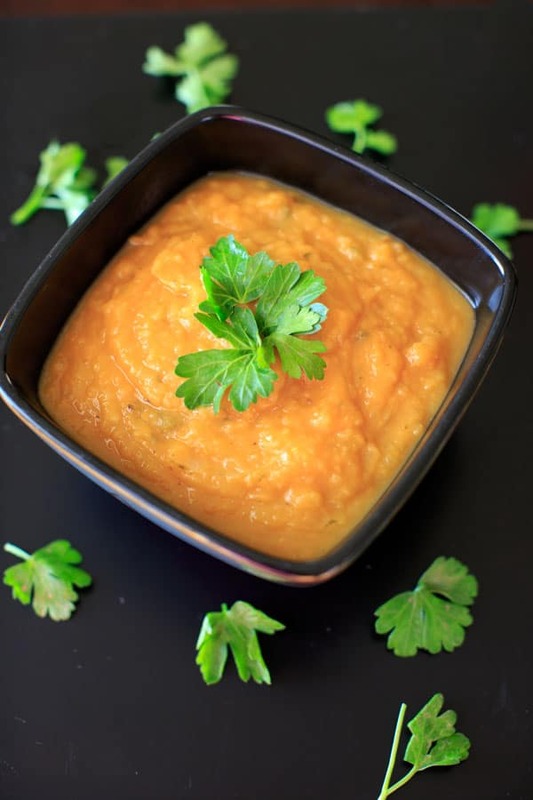 If you’re looking for a thick, delicious soup and love sweet potatoes, then this sweet potato and apple soup should go on your meal plan this week. I roasted the sweet potatoes and apples first but you could instead cook them in the pot of vegetable broth. On medium-low for 20 minutes or so until tender before using the immersion blender. That’s the strategy I used for the butternut squash and apple soup. Fresh parsley makes a big difference here, not only for the flavor but also the color splash. This soup is great with some homemade challah bread too! 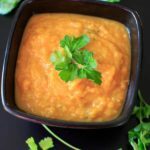 Sweet Potato and Apple Soup - only 4 main ingredients plus spices makes this a super simple and delicious thick soup for the colder months. Place cubed sweet potato and cut apples on a baking sheet and roast in oven for 20-30 minutes until tender. A few minutes before taking sweet potatoes out of the oven: In a large pot, saute olive oil and onion over medium heat for 5 minutes until onions are translucent. Add to the pot roasted sweet potatoes and apples, vegetable broth and salt and pepper as needed. Use an immersion blender to blend to desired consistency. If soup is too thick, you can add water or more vegetable broth as needed. Serve hot and garnish with fresh parsley. Ok, you have me convinced. I’ll try adding some apple to my next sweet potato soup! I added rice milk to make the soup thinner, and it was good! Really sweet.